When walking through natural surroundings, it can be unnerving to see a leaf suddenly take flight with a chirping sound. Several varieties of insects that appear to be leaves are found throughout the world, including the United States. Commonly kept as pets, these insects spend most of the day masquerading as foliage and only become active at night. Commonly found throughout the continental United States, the katydid (Microcentrum rhombifolium) looks like a fresh green leaf standing on its edge until it begins moving around on its grasshopper-like green legs. 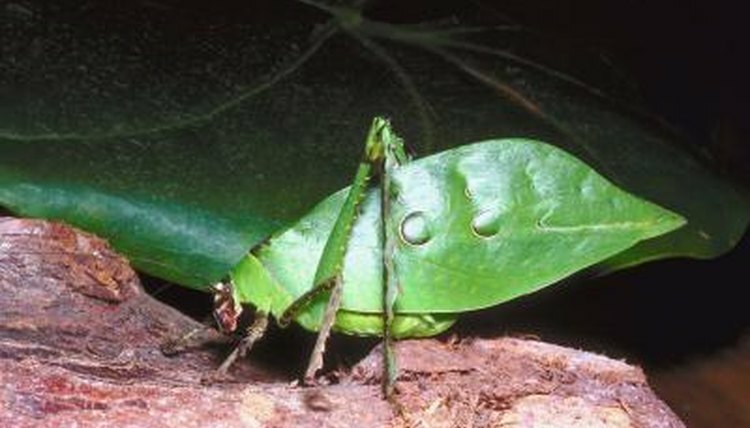 The leafy body quickly transforms to reveal wings that can bear the katydid away from imminent danger. The katydid can grow more than 2.5 inches in length, and it begins its life in an egg case that looks remarkably like a seed caught on a twig. "What do you get when you cross a grasshopper with a leaf," may sound like the opening of a bad joke, but the false katydid (Scudderia sp.) fits that description to a tee. About 2.5 inches in length, the false katydid has brilliant green coloring and makes a "katy did" call. Rather than looking like a leaf turned on edge, the false katydid appears like a large grasshopper with a leaf rolled over its body. Native to tropical forests in the Philippines, the leaf insect (Phyllium philippinicus) is one of the most common of the leaf insect species kept as a pet. Broad wings lay flat along the back of the females give the appearance of a fallen leaf, complete with veins and browning edges. Legs and antennae also have a smaller, leaf-like appearance. Females commonly exceed 2.5 inches and are unable to fly while males are smaller and fly away when disturbed. Native to Malaysia, the giant leaf insect (Phyllium giganteum) appears to be a tattered leaf that has fallen from a plant, complete with browning edges, a distinct central vein and ragged brown areas that make it appear as if something has taken a bite out of it. This 4-inch leaf insect continues the ruse when you pick it up, staying motionless like its namesake. No males of the species are known and young hatch from unfertilized eggs.